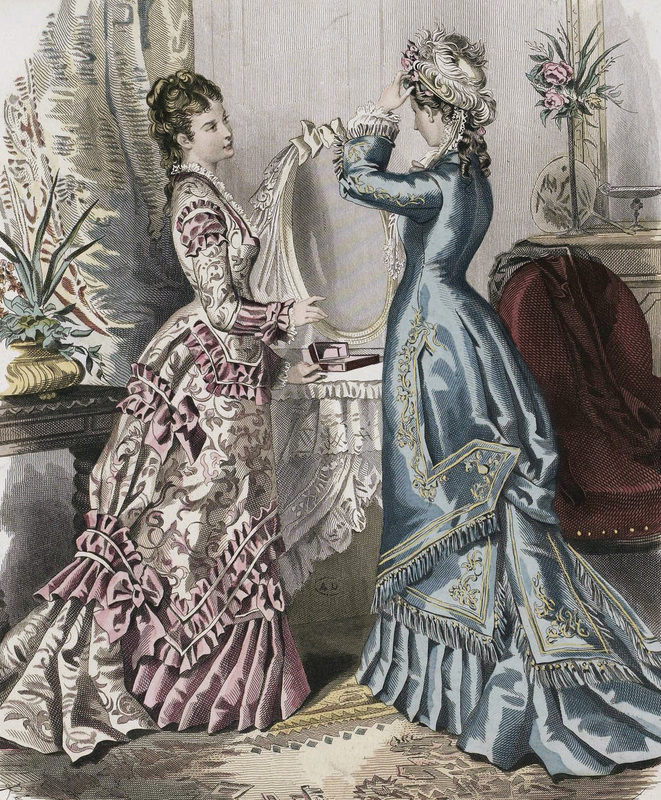 Today we have two dresses from La Mode Illustrée, 1876. In 1876, the Natural Form style was just beginning. Styles were beginning to simplify. The bustle had dropped and the back of the dress was becoming the focus. A long, narrow wire bustle would be worn to achieve this silhouette, along with a flounced petticoat. On the left we have what appears to be a princess-cut reception dress in a pink and white brocade. It has a low, square neckline edged with lace. The long, narrow sleeves have pink puffs and ruffles at the shoulder, and a pleated cuff at the wrist. The pink underskirt has wide, full pleats that tilt diagonally. The overskirt arches in the front and is gathered into a short train at the back. A shirred ruffle edges the overskirt, dipping into a V at the sides and widening into a flounce above the train. Narrow white bands serve to decorate the ruffle and hide the gathering stitches. She wears neither gloves, nor jewelry. Her hair is parted and waved at the front and is pulled into a number of puffs, with curls hanging down the back. On the right is a princess-cut day dress of sky-blue silk, embellished with gold embroidery in a vine motif. The front is obscured, but it appears to have a jacket-style collar, with a long, lacy jabot. The three-quarter sleeves have wide cuffs and white puffed under-sleeves. A band of gold embroidery runs down the back of each sleeve, while more embroidery and a fringe of gold decorates the cuffs. The underskirt is very plain, with wide pleats and a short train. The overkskirt has an interesting side detail, which is edged with more gold embroidery, as well as blue and gold fringe. The center of the back skirt is caught up, with rectangular panels that extend over the train. Each embroidered panel is trimmed with gold and fringed. She wears no gloves or jewelry, just a hat that’s covered with ostrich feathers and pink flowers. Her hair is pulled up, with two ringlets down the back. Which of these two dresses is your favorite—the blue or the pink? Do you think these are good examples of early Natural Form styles?